Like our standard custom silicone bracelets, ink filled wristbands highlight shading inside of the letters and work of art of your message. You get each and every advantage of famous debossed wristbands, in addition to somewhat more interesting. Thus, get your custom ink filled debossed wristbands and customized wristbands working for you today. 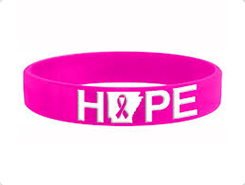 These color filled wristbands have a huge market demand. 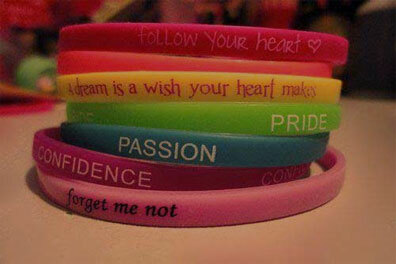 These silicone bracelets with an engraved message are filled with specialized color ink. And now you can easily customize, personalize and design with your own colors, fonts, and messages. This is the most effective and affordable way to spread words for your cause. Are you looking for a good promotional product? You need to take into consideration your target market. The product that you want to promote must represent your business and message. And as per wristbands are concerned, these are the products that can be worn on any occasion. These color filled wristbands are cost-effective product that can be used as a promotional product. If you want to make a strong presence for the products and services of your company, color-filled wristbands are the best choice. This is an easy way to advertise your products without spending much on TV advertisements and other similar stuff. As we now that the ink filled in bands may wear off but your message will always be readable as its sunken into the band. So this need to be kept in mind while reviewing a technique to make a band. At WristbandBuddy, we offer ink-filled silicone bracelets that are a good option for schools, fundraisers and promotional and other events. These are 100% latex-free silicone bands that are waterproof and can be modified as per the need. These are the best way to promote your products and services. ORDER NOW and avail the best and high-quality bands at affordable pricing.